Our family is sick! Like the whole family, moms, dads, kids, everyone, Mama Dawn had some asthma complications and spent a few days in the hospital. Oddly enough mama carol has stayed well, So this evening she set out to make her family famous Pot of healing chicken noodle soup. It’s funny because I could use the same ingredients to make a pot of soup for myself and it just doesn’t taste the same. I fully believe it’s because Love has a flavor, though I use the same ingredients, I just don’t make it with the love that she puts into it (this is also evident in her pancakes,and grilled cheese.) There is something about the heat, and the steam rising up to meet your face that helps to clear your mind, body, & soul. 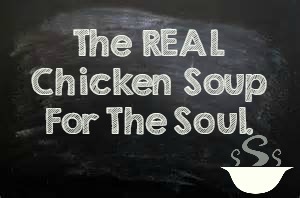 There is a healing that comes with moms pot of soup, I don’t doubt that she puts some prayer in there as well, which contributes to the healing.